looking for the best kids activity. betty hoops has a hula hoop decorating kit. hula hoop kit is great for parties. this kids party kit is hoola hooping was featured with first lady michell obama. president barack obamas wife was hula hooping for her childrens school program lets move. the hula hoop party package comes complete with precut fabric, rainbow colored tape and 3d stickers. Betty travels to your outdoor or indoor location. She provides all hoops, music and obstacle course supplies. Betty performs for 1 song, teaches everyone how to hoop and then teaches dozens of dance moves and tricks. Kids learn dozens of fun tricks and dance moves. A hoop contest is offered and always the hit of the party. The adult guests enjoy this just as much as the kids! Betty brings her Idiot Proof collapsible hoops for adults use and purchase. DON'T LIVE IN THE ASPEN VALLEY ? HOOP DECORATING: 1hr. 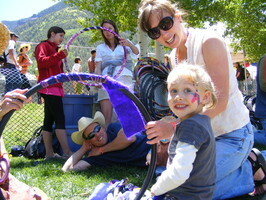 Kids decorate and keep their own properly sized and weighted hoop. They use fuzzy fabrics, rainbow colored tapes and 3D stickers. No Glue-No mess! KIDS HOOP WARRIORS: 1hr. Indoor and outdoor locations. Kids get to stomp, swim, jump and soar through rock and pop beats. They learn over 20 hoop tricks and try their shot at the ultimate hoop obstacle course, hoop limbo, hoop relays and hoop contest! Hoop Jam: 1-2hrs. A combo of Hoop Decorating and Kids Hoop Warriors.